Starbucks is opening the first of up to 1,000 high-end Reserve stores, spending big on offering cocktails and Italian morsels to reach the higher-end, fuller-service part of the food and beverage market. Falling rents in premium retail locations may ease the way, says Howard Schultz. Starbucks wants to introduce America to Italian aperitivo culture. 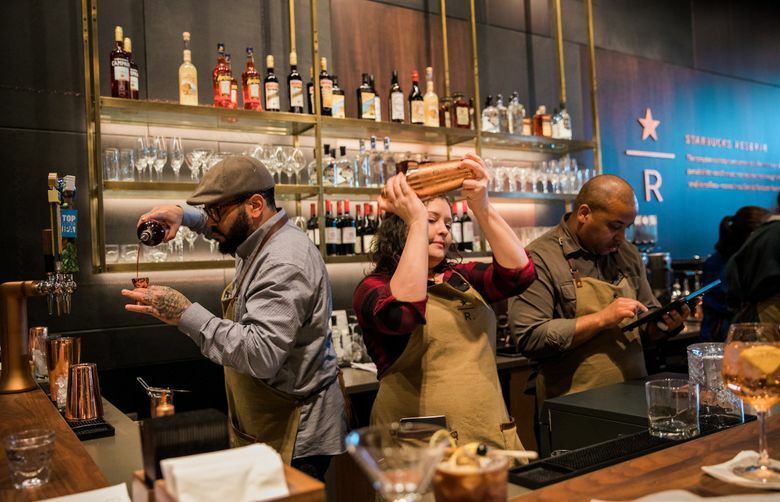 A bar offering pairings of appetite-inducing cocktails with ingredients such as Aperol and Campari, served alongside aged parmigiano reggiano and Cerignola green olives, anchors one corner of the company’s new Reserve store, opening on the ground floor of its Sodo headquarters building Tuesday. It’s the first of up to 1,000 such high-end stores Starbucks has said it plans to open as it spends big on an expansion toward a higher-end, fuller-service part of the food and beverage market. Starbucks executive chairman Howard Schultz sees falling rents in premium retail locations easing the way for his plans. The Reserve store would feel familiar to someone who has visited the company’s larger Roastery showpieces, which opened on Capitol Hill in 2014 and Shanghai last year. Four more Roasteries are planned in Milan, New York, Tokyo and Chicago in the next two years. But while the Roasteries, with their centerpiece coffee roasters, have an explicit educational and entertainment function – “the theater of coffee,” in the words of one Starbucks spokeswoman – the Reserve stores’ scale and layout hews closer to the company’s concept of a “third place” to gather and linger. With the addition of a full bar, Starbucks hopes it can finally persuade customers to linger on into the afternoon and evening, when cravings shift from caffeine to booze. 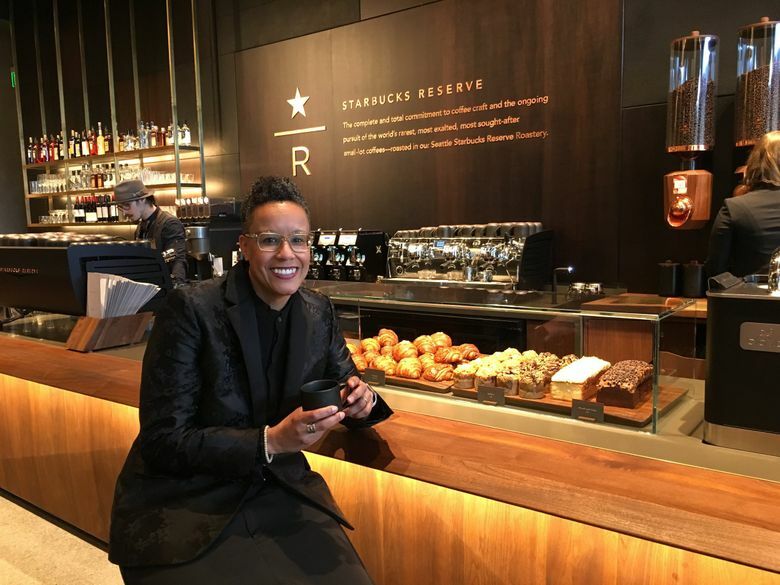 “We want to be a part of the community and are looking forward to being a stop on the way to sporting events, on the way to theater, on the way to concerts,” said Shauna McKenzie-Lee, director of operations for Starbucks’ Siren Retail line, which includes the Roastery and Reserve store formats. The Roasteries could perhaps be justified as loss leaders for their hagiographic treatment of coffee and the Starbucks brand – particularly its championing of small-farm, small-batch single origin coffees. But the number of the Reserve stores indicates they’ll have to make money on their own merits. Wall Street analysts have pressured company executives about spending associated with its shift to higher-end store formats. Starbucks would not disclose what it cost to build the Reserve store. At 8,100 square feet including the back of the house, the Reserve Sodo is four times larger than a typical Starbucks. An adjoining 10,000-square-foot Princi bakery kitchen, which serves multiple outlets, is visible through a glass wall adjacent to the store’s large, black ovens. Starbucks invested in Princi in mid-2016. The bakery, from Italian chef and master baker Rocco Princi, is the exclusive food provider to Starbucks’ Siren Retail stores, as well as a stand-alone bakery brand. As if to allay those cost concerns, Starbucks released a memo from founder and chairman Howard Schultz in which he describes a favorable real estate market for the kind of expansion the company has embarked upon. 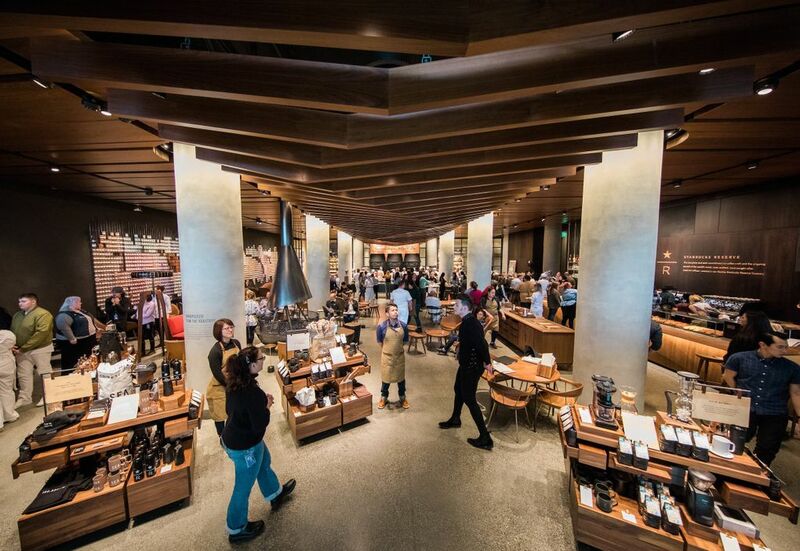 For now, Starbucks plans a second Reserve store later this year in Chicago. Princi bakeries should also begin to appear in the U.S. later this year. Information in this story was updated Feb. 27, 2018. An earlier version incorrectly identified Howard Schultz as Starbucks’ founder. The company was founded as a coffee roaster in 1971 by Jerry Baldwin, Gordon Bowker and Zev Siegl. Schultz was hired in 1982 before leaving to found Il Giornale, which acquired Starbucks in 1987 and began expanding it.